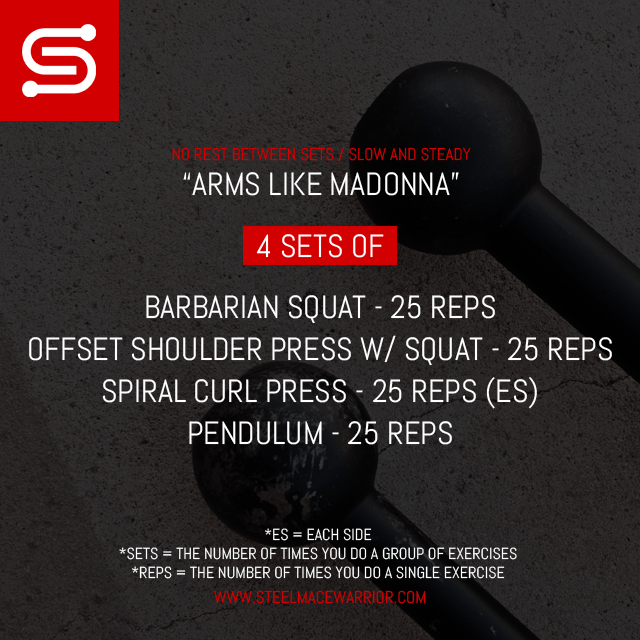 Steel Mace Workout to get “Arms Like Madonna”! Okay so first of all i hope you are enjoying the titles i am giving to the Steel Mace Workouts. I wanted to give ya’ll a little smile today with “Arms Like Madonna”. The awesomeness about this workout is that it works out more than just the arms. It will also work out your chest and back. Remember, slow and steady movements with no breaks or rests in between. If it’s not challenging enough for you, add more sets with a little heavier weight. Have a great time with this one and as always read everything on this page because i link out to several other resources to help you do this workout correctly and safely. Have an awesome Friday! Side note: I honestly think this will actually give you better arms than madonna. haha.